So I jumped on the bandwagon and ordered myself a St. Moritz tanning mousse a few weeks back. I have used up the entire bottle and would like to sum up my experience with this product. I have mentioned this over at heartmycavies, but figure I should attempt an in depth review on the beauty blog now. First of all, I would like to clarify that the bottle I bought is labeled “St. Moriz” instead of “St. Moritz” like I thought it should have been labeled. I initially thought that the manufacturer made the typo on a bunch of these bottles, as I saw others with the same problem. After never seeing one St. Moritz bottle, I am just going to assume that they are just spelled that way. I ordered a 200 ml bottle from Ebay for about $9 including shipping from the UK because they just don’t sell them here in the States. St. Tropez, sold at Sephora, costs $40. People say they’re comparable, but I have never tried St. Tropez for myself. 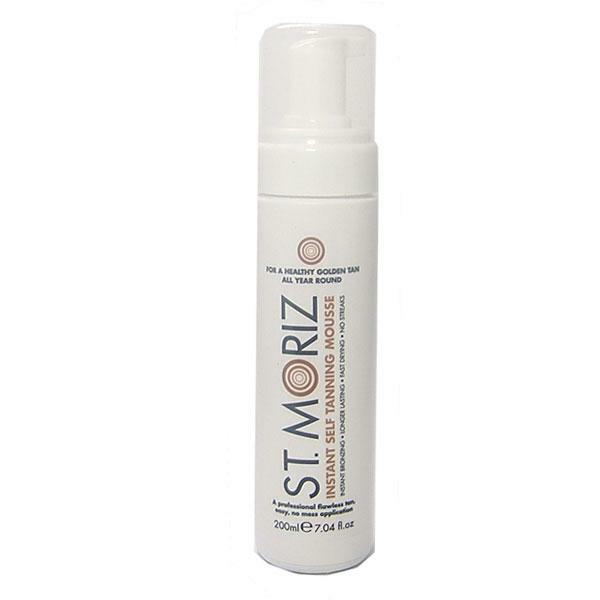 I believe you can get St. Moriz from Boots or some department stores if you live in the UK. Anyway, the application was simple. After getting out of the shower, I pumped the mousse out on my hands and just applied from the bottom up. I washed my hands after each leg application and so on. My hands were a little stained, but since I wish my hands often the stain quickly faded. I like the consistency of the mousse and had virtually no streaks. That may also be because it applies so light that there was not much color. The color that appeared on my skin was a nice light bronze, no orange at all. It comes out a dark chocolate color, a little runny. My skin is pretty pale because I constantly avoid the sun. I was expecting a lot of color to show. The initial application of St. Moriz left me dissatisfied and disappointed. 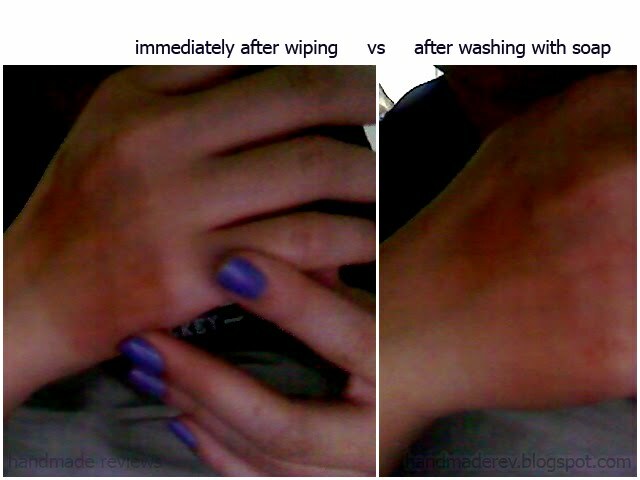 I thought to myself, I just will avoid too much washing and apply again really soon. Well, by the next morning, I noticed that the color had intensified. Rather than fade, it continued to grow darker within the next two days of application. Because I only had one bottle of tanning mousse, I was reluctant to scrub and exfoliate my tan. I wanted the color to last as long as possible. 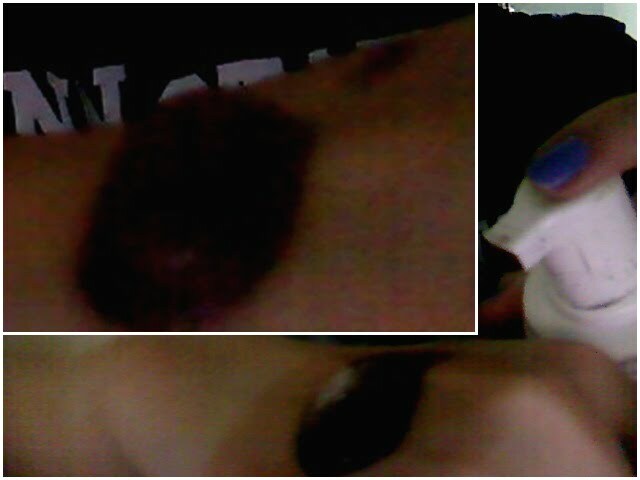 It faded gradually after the second/third day. I had no problems with blotches or streaks despite not exfoliating. The color completely faded after about 6 days. My hand stained even though I wiped it, took picture and then went to wash it. Overall, I would say that I am pretty satisfied with the St. Moriz tanning mousse. The smell is not all that bad and goes away in one shower. It is not orange or streaky. It develops well and fades well (for me). I have heard that the fading process was bad for some people. lollipop26 seems to have had a problem with blotches and streaks. I am not sure why it did not happen to me. Maybe it just works with my skin. Anyway, at this price and value, I am sure to repurchase. So have you tried this? How was your experience with it? Other recommendations? I've been using this tanner for a while now (I live in the U.K) and I'm really pale, I use the dark version.. I noticed that you said that the tanner is runny. I would suggest shaking the bottle really hard (WITH the lid ON) before pumping as this makes it into a really nice, dense foam which makes it easier to apply and it won't drip anywhere. Also, you said that it stained your hands..I find that 90% of tanners will do this, (I say 90% as I haven't tried all of the tanners ever made, but the ones I have tried have stained) although this one is fairly easy to remove from the palms of the hands, I would still recommend using disposable gloves (like the ones you get with hair dye)it saves all the hassle, especially if you apply before going out. I buy mine from the pharmacy for £1.00 for 20 gloves..and they work really well. I also find that finding a good shade of make-up (foundation/powder etc) that matches the tan, quite hard, so I put a pea sized blob of moisturiser with the same amount of tanner and mix together, then apply to my face, that way you will be beautifully tanned all over! If anyone else reading this has trouble with it going patchy, it's different for all skin types and like most other brands will go darker and tend to 'stick' for longer on dry skin, which will in turn make it patchy. Make sure you moisturise before you apply (you only really need to do your dry bits, knuckles, knees, elbows etc), then reapply moisturiser every day, all over, that way the skin will keep 'sucking in' the moisture, along with the tanner and it should last longer, no patches and you'll be lovely and soft too! I hope you enjoy St.Moriz for a long time! Oh another quickie, i wouldn't ever apply with my hands, it stains too fast, use a tanning mitt, it's sooo much easier! Hiya new follower here from the uk 🙂 love your blog! just wanted to give you my feedback on St Moritz, after being an avid St Tropez user since I was about 15 (8 years) i discovered this, at the time I was running out of tan and couldn't really afford another bottle until payday, so i bought this on a whim not expecting much from it at all, BUT i am a complete convert! honestly i will never go back to St Tropez i love everything about this, the colour, application, the smell (hardly there) it also doesn't transfer onto clothes if you don't use a moisturiser beforehand, I just use it after I've washed it off, and when it comes off i dont look like i have some sort of strange skin disease! Thanks Rach. 🙂 I will just wash my hands a little more often. Woah, you stained your hand for blog pictures. Props to you. What about St. Tropez did you not like? From what I have read, the two products are very similar. Maybe we can compare experiences to see if it is worth trying the other product. St. Moriz Tanning Mousse Review is a beautiful topic review St. Moriz tanning debate for Apr 2019. I read Revision Skincare Intellishade SPF 45 Matte Tinted Moisturizer Review .